After a construction worker unearths a human skull on the campus of the University of Mississippi dating to the 1960s, an older woman's desperate attempt to erase history counts down the five manners of death. Dr. Diana Bratton is a surgeon surrounded by bodies after the discovery of her Aunt Phoebe's 50-year-old note detailing the manners of death. Suicide, accident, natural cause, and one death classified undetermined are soon crossed off this list--leaving Diana to believe that only murder remains. When Diana spots photographs in a 1966 university yearbook, Phoebe is linked not only to that death, but to the recent deaths of two local men. Diana is torn between pursuing Phoebe's innocence and accepting police theory that her aunt is involved in the murder of several men she knew in college. 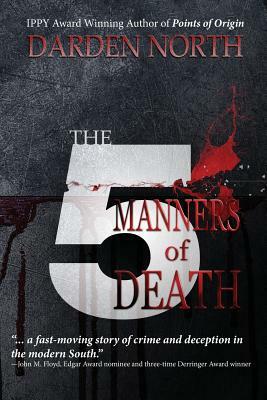 In "The 5 Manners of Death," Dr. Diana Bratton steals precious time from her young daughter, her surgical practice, and her hopes for renewed romance to clear Aunt Phoebe's name of multiple murder and uncover the significance of the list. Even as Diana searches Phoebe's home basement for evidence, she works to trump the police and outrun the conspiracy between her ex-husband and Phoebe's long-time lover--her quest to expose the truth overshadowed by a need to rebury the past. Even though she realizes there is a chance to save her shrinking family, Diana understands that of the five ways to die, murder is her family secret.